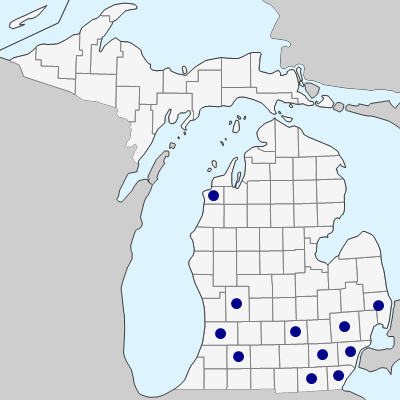 Disturbed places, a weedy species introduced from Europe and first collected in 1886 in Ingham Co. The panicle is much smaller, narrower, and with fewer spikelets than in B. commutatus, and the whole plant is smaller (ca. 30–40 cm tall, compared with 50–90 or even 120 cm in B. commutatus, although depauperate individuals are sometimes smaller). MICHIGAN FLORA ONLINE. A. A. Reznicek, E. G. Voss, & B. S. Walters. February 2011. University of Michigan. Web. April 20, 2019. https://michiganflora.net/species.aspx?id=2039.